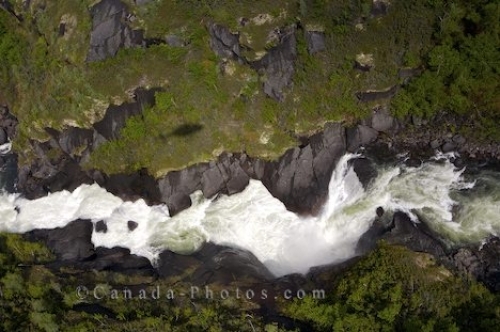 Standing on the ledge above this waterfall gives one the true feeling of how fast the water is moving down the mountain side in Southern Labrador in Newfoundland Labrador. Hiking through the Mealy Mountains in Southern Labrador in Newfoundland Labrador, Canada you will come across many waterfalls. Looking down upon this waterfall from the cliff above, one can see that the water is moving at a rapid pace through the cut out landscape of the Mealy Mountains. Picture of a fast moving waterfall in the Mealy Mountains in Southern Labrador in Newfoundland Labrador, Canada.